Benjamin West has always been a difficult artist to classify. American historians generally claim him as an American artist as he was born in what would become the state of Pennsylvania. West’s earliest paintings date from his fifteenth year, and if his own attempts at myth making are to be believed—they should be taken with the proverbial grain of salt—he was mostly self taught. West taught two successive generations of American artists. All of these men traveled to his London studio and the most returned to the United States. Indeed, a list of those who searched out his instruction comprises a “who’s who” list of early American artists and includes names such as Charles Willson Peale, Gilbert Stuart, John Trumbull, Thomas Sully, and Samuel F. B. Morse. If his role as a teacher was the first avenue to West’s fame, surely his history painting is the second. Of the many he completed, The Death of General Wolfe (1770) is certainly the most celebrated. In this painting, West departed from conventions in two important regards. Generally, history paintings were reserved for narratives from the Bible or stories from the classical past. Instead, however, West depicted a near-contemporary event, one that occurred only seven years before. 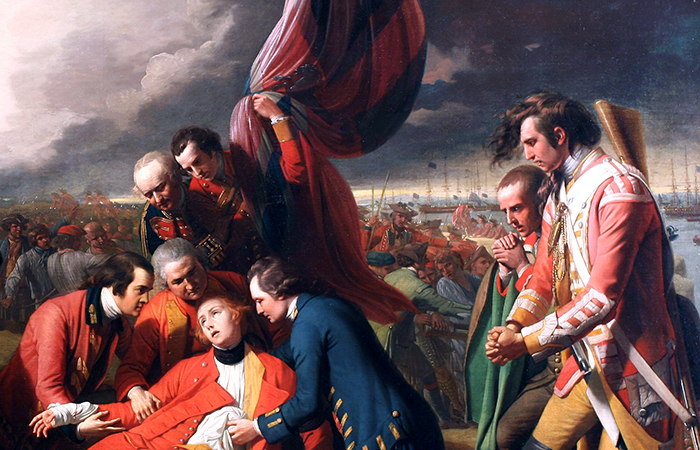 The Death of General Wolfe depicts an event from the Seven Years’ War (known as the French and Indian War in North America), the moment when Major-General James Wolfe was mortally wounded on the Plains of Abraham outside Quebec. Yet despite West’s interest in “truth,” there is little to be found in The Death of General Wolfe. Without doubt, the dying General Wolfe is the focus of the composition. 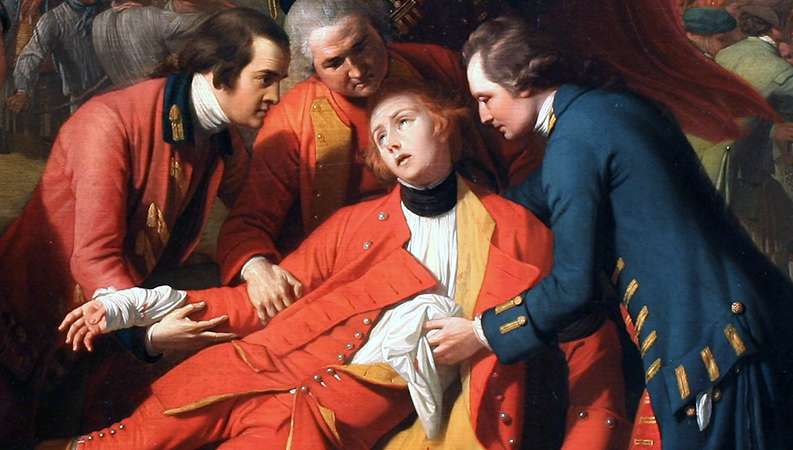 West paints Wolfe lying down at the moment of his death wearing the red uniform of a British officer. A circle of identifiable men attend to their dying commander. Historians know that only one—Lieutenant Henry Browne, who holds the British flag above Wolfe—was present at the General’s death. 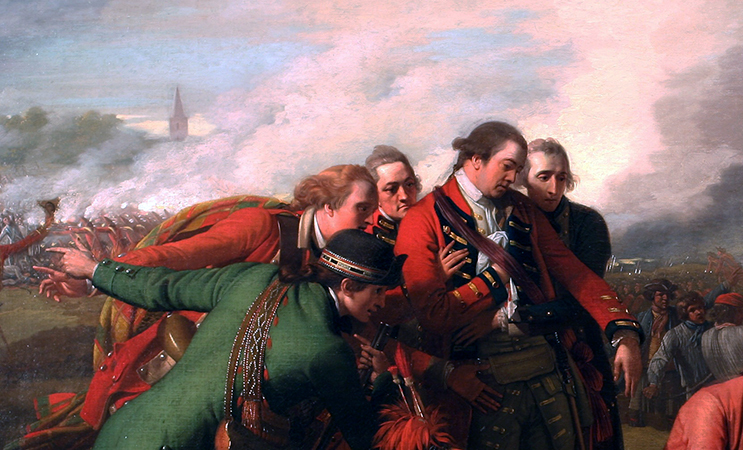 Clearly, West took artistic license in creating a dramatic composition, from the theatrical clouds to the messenger approaching on the left side of the painting to announce the British victory over the Marquis de Montcalm and his French army in this decisive battle. Previous artists, such as James Barry, painted this same event in a more documentary, true-to-life style. In contrast, West deliberately painted this composition as a dramatic blockbuster. This sense of spectacle is also enhanced by other elements, and West was keenly interested in giving his viewers a unique view of this North American scene. This was partly achieved through landscape and architecture. The St. Lawrence River appears on the right side of the composition and the steeple represents the cathedral in the city of Quebec. 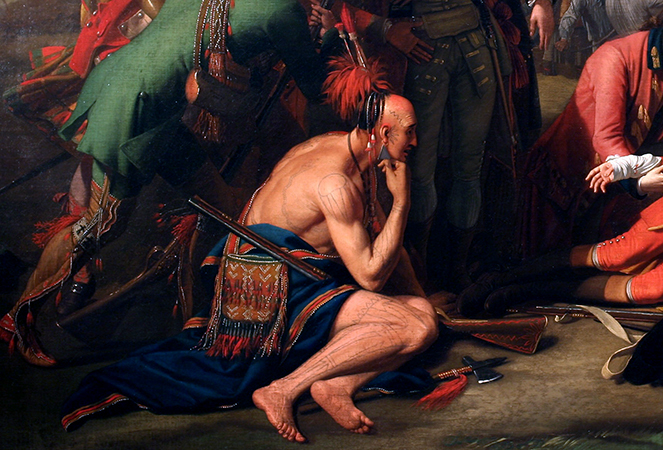 In addition to the landscape, West also depicts a tattooed Native American on the left side of the painting. Shown in what is now the universal pose of contemplation, the Native American firmly situates this as an event from the New World, making the composition all the more exciting to a largely English audience. Perhaps most important is the way West portrayed the painting’s protagonist as Christ-like. West was clearly influenced by the innumerable images of the dead Christ in Lamentation and Depositions paintings that he would have seen during his time in Italy. This deliberate visual association between the dying General Wolfe and the dead Christ underscores the British officer’s admirable qualities. If Christ was innocent, pure, and died for a worthwhile cause—that is, the salvation of mankind—then Wolfe too was innocent, pure, and died for a worthwhile cause; the advancement of the British position in North America. Indeed, West transforms Wolfe from a simple war hero to a deified martyr for the British cause. This message was further enhanced by the thousands of engravings that soon flooded the art market, both in England and abroad. 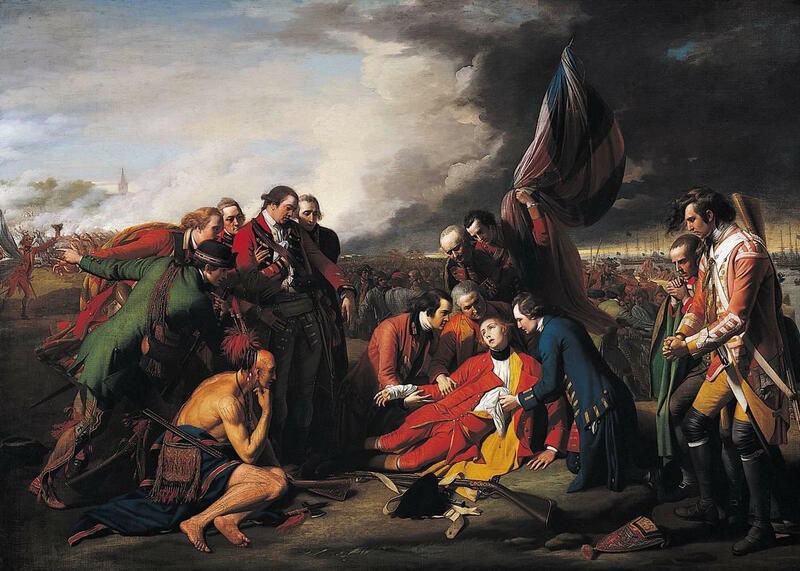 Benjamin West’s The Death of General Wolfe justifiably retains a position as a landmark painting in the history of American art. In it, West reinterprets the rules of what a history painting could be—both in regard to period depicted and the attire the figures wore—and at the same time followed a visual language that would have been familiar to its eighteenth-century audience. This composition set the stage for the many ‘contemporary’ history paintings that John Singleton Copley and John Trumbull painted throughout the rest of the eighteenth century. Cite this page as: Dr. Bryan Zygmont, "Benjamin West, The Death of General Wolfe," in Smarthistory, August 9, 2015, accessed April 22, 2019, https://smarthistory.org/benjamin-wests-the-death-of-general-wolfe/.